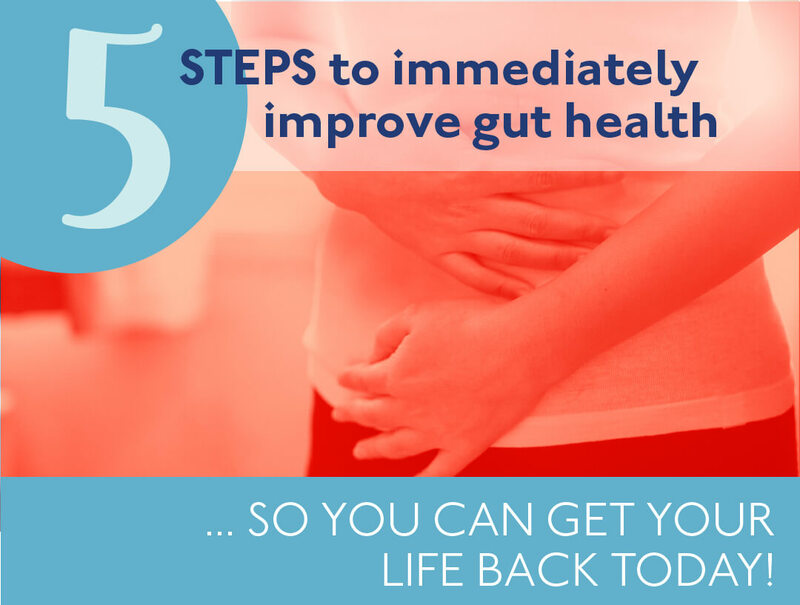 Are you always on the lookout for “healthier, gut loving” options? 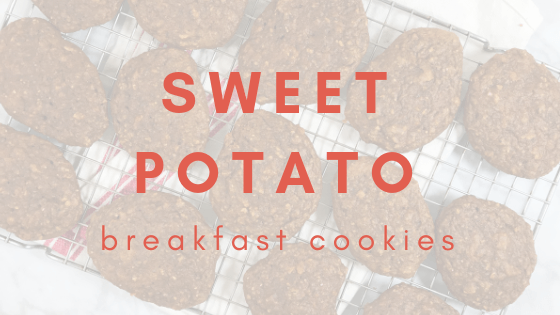 We’ll I’ve got one for you today, Sweet Potato Breakfast Cookies. Don’t let the title fool you, these treats can be eaten anytime of the day for a healthy boost of carbohydrates, protein and healthy fat! So many of you are realizing that it’s time to “clean up” your diet. Hey, there’s no shame in that. It’s never to late to make some changes, especially ones that are going to help you live your best life. We have sweet (processed) temptations everywhere and it’s okay to eat them once in a while but for the most part it’s important to be focusing on ingredients that really elevate your nutrition and health to the next level. Processed foods with white sugar are absolutely toxic to our gut and the good bacteria that we are trying to grow and maintain. Keep in mind, when you are weaning off white sugar and going “cleaner” you will find that foods are not as sweet or as sweet as you would like. Don’t give up, taste buds change and so do your desires for more healthy foods. These cookies may not be as sweet as you would like but let me tell you about the bursting nutrition in these treats. 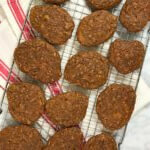 Not only are they a great balance of macronutrients; carbohydrates, protein and fat but these cookies are full of vitamins, minerals and other amazing things like antioxidants, phytochemical and omega-3 fatty acids!!! What are some of these “healthier” ingredients you can use to elevate your nutrition and health to the next level? What’s the nutrition of a sweet potato? Because the base of this breakfast cookie is sweet potato let’s take a quick look at it’s nutritional breakdown. Sweet potatoes are more carbohydrate (of the 3 macronutrients) than anything else at 20%, protein content is 1.6% and fiber is 3% with almost no fat. Fiber in sweet potatoes comes in two different forms; soluble and insoluble. Soluble fiber such as pectin helps with satiety, a decrease in food intake and better managed blood sugars by digesting food slower. Insoluble fiber such as cellulose, hemicellulose and lignin help reduce diabetes and improve gut health. Sweet potatoes are full of vitamins and minerals such as vitamin A, C, E, B6, B5 and potassium and manganese. They are rich in other plant compounds such as beta-carotene, chlorgenic acid and coumarins. What are some of the health benefits of sweet potatoes? Help Prevent Vitamin A Deficiency: orange sweet potatoes contain a variety of beta-carotene that is highly bioavailable. Because of this they have been shown to have a remarkable ability to increase vitamin A blood levels compared to other beta-carotene sources. Enhance Immunity: the production of immune cells that fight off disease and infection are stimulated by vitamin A. Assist in Weight Loss: because sweet potatoes are so nutrient-dense and loaded with fiber this can help you in your weight loss/weight maintenance journey. Fiber moves much slower through the digestive track, this promotes satiety and can help cut food cravings. Support Vision Health: without adequate vitamin A you may experience dry eyes, night blindness and even a buildup of keratin on the conjunctiva. Reduce Risk for Cancer: oxidation is damage to our cells in the body that is often associated with risk for cancer. Diets rich in antioxidants have been associated with decreasing the risk of stomach, kidney and breast cancers. Studies have shown that the antioxidants in sweet potatoes actually “neutralize” free radicals that increase our risk of cancer. What can you do with a sweet potato? Sweet potatoes are so versatile and inexpensive, bursting with nutrition and really easy to incorporate into your diet. In a large bowl, combine mashed sweet potato, eggs and peanut butter. Mix well. Add vanilla, cinnamon, maca powder, maple syrup, chia seeds, pecans and unsweetened dried cherries. Stir and combine well. Add oat flour and baking soda to mixture. Stir and combine well. Line 2 cookie sheets with parchment paper. Scoop onto cookie sheet. Use spoon to flatten and shape cookie. I might be a little lazy but I find these cookies hard to get into a good circular shape. Many times they are more oblong but the great thing about that...they fit nicely in the small snack-sized baggies. With one batch of this recipe you can get at least 24 cookies maybe up to 28 cookies. They freeze nicely. So a great way to prep for several weeks ahead. Enjoy them at breakfast or as a snack. I’d love to know if you make this recipe and what you think. Please drop me a line below! Previous PostPrevious Which Poop Are You?